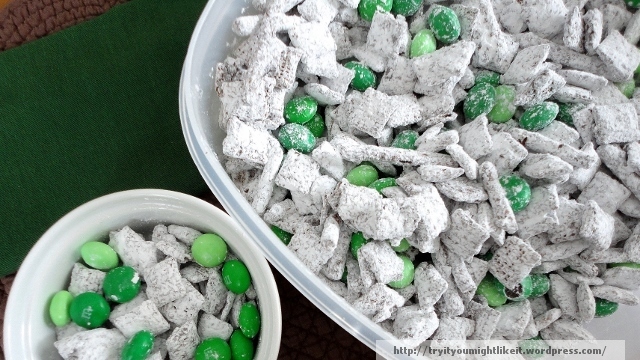 Going with a green theme for the St. Patrick’s Day party led me to this recipe. We did a test run of the recipe (adapted from Shugary Sweets) to make sure it would work for the party. I’ve decided not to serve this at our party because it’s just so messy. The powdered sugar gets everywhere. Having a party makes enough of a mess without this. It’s a yummy treat though so don’t let the mess-factor completely deter you. Place the cereal and pretzels into a large bowl. Pour the baking chips into a microwave safe bowl and microwave, 30 seconds at a time, stirring between until melted. 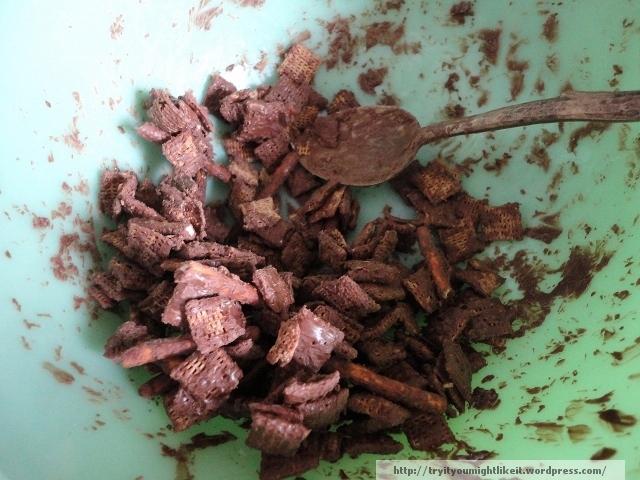 Pour over cereal and pretzels then toss to coat evenly with the melted chocolate. 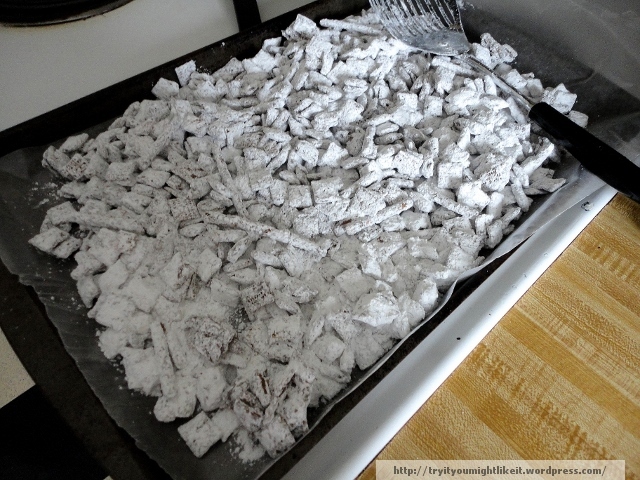 Place about half of the mixture into a gallon-size zip-top bag and pour powdered sugar over it. Seal the bag and shake to coat. 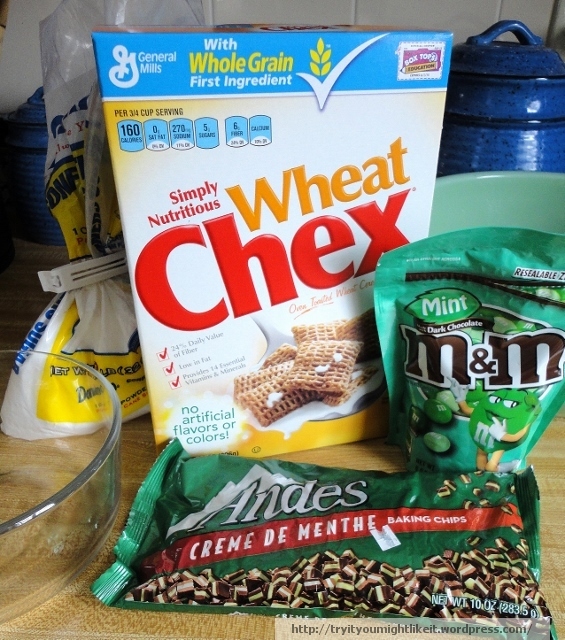 Using a slotted spoon remove the coated cereal and pretzels from the sugar and spread over a baking sheet lined with wax paper. Repeat until all the cereal has been coated in sugar. Allow to cool until the chocolate is set. Transfer to your serving bowl or container. 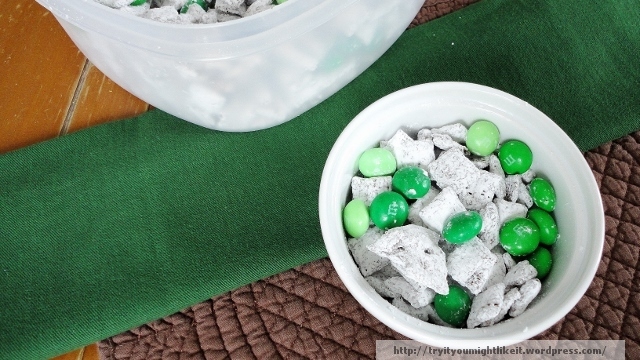 Add the M&M’s and toss again. 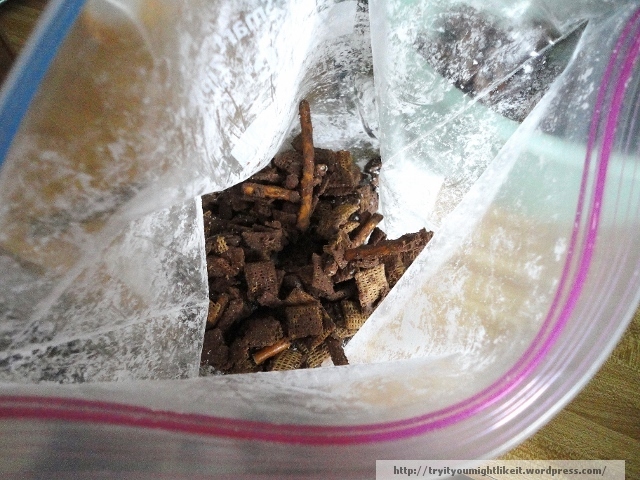 Store in an airtight container or serve right away. I needed institute a “wash your hands before playing the piano” rule this past week. Husband kept complaining that the piano keys were sticky and I believe this treat was to blame.